Toni Rossall (born 19 October 1995) is an Auckland born New Zealand professional wrestler. 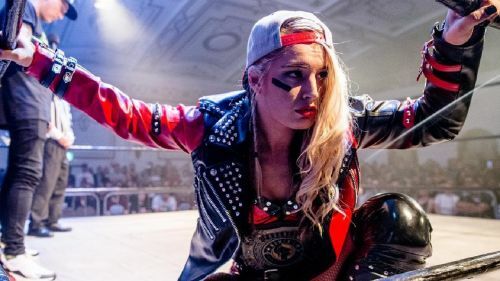 She is currently signed to WWE performing on the NXT UK brand under the ring name Toni Storm. She is a former World of Stardom Champion as well as the SWA World Champion and has a lot of achievements under her belt before making her way to WWE. Toni is known for her work in the European independent circuit, where she is a former Progress Women and is a two-time and current wXw Women's Champion. In WWE, she competed in the 2017 and 2018 Mae Young Classic, making it to the Semi-Finals in 2017 and the finals of the tournament in 2018 at WWE Evolution. On October 28, 2018, at WWE Evolution she defeated the fan-favorite Io Shirai to win the Mae Young Classic and thus become a part of the NXT roster for the long haul. With her eyes firmly set on the women’s championships in WWE and the ambition to make it to the main roster, there is a lot that lies ahead for the young Storm. Let’s take a look at 5 interesting things about the impressive superstar and how that can help her ultimately become the face of WWE’s women division. Born in Auckland, New Zealand she made her first wrestling debut at the young age of thirteen at the Impact Pro Wrestling Australia (IPWA) on 9th October 2009. After her debut, she felt that she needed to train harder and she convinced her mother to let her move to Liverpool, England with her grandmother. Toni trained under Dean Allmark during her time in Liverpool, who is a professional English Wrestler. Toni calls Liverpool her home but her love for wrestling has made her travel far and wide for training. She has spent most of the previous year training in Japan, which isn't an easy feat as she loves being home and spending time in her own bed. This ambitious girl stepping out of the comfort zone to challenge her skills is the most important thing which has brought her a lot of success at such a young age.